Jessica L. Susie | Attorneys | Brick Gentry, P.C. Jessica Susie joined Brick Gentry, P.C. as an Associate In 2011. She counsels clients in general practice matters, including but not limited to intellectual property, trademarks, and copyrights. Jessica assists in the prosecution of patent applications and the preparation of patent and trademark availability and infringement opinions. Jessica was born and raised in Spencer, Iowa. She earned her degree in biology from Iowa State University in 2004, graduating with distinction. Prior to attending law school, she worked in a molecular genetics research laboratory. 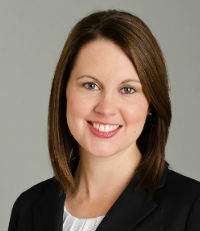 Jessica earned her law degree from the University of Iowa College of Law, graduating with high distinction and as a member of the Order of the Coif.